Connect 4 – on paper! I wanted to bring the game Connect Four to work, but then realized I don’t actually own the game. I forgot to go buy it, and now I was stuck with no game and a game time coming up. Solution? 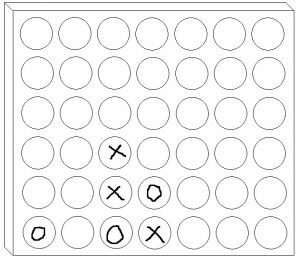 Print a game board on paper, and draw it using X’s and O’s as the pieces. Works great! I imagine this will be useful to have on hand as a “travel” version of the game, with no pieces to drop and lose. Here’s a downloadable PDF of the game board I drew, with 2 printed per sheet. If you wanted even smaller boards to save paper, you could print multiple copies of the PDF on one page. Author erinkPosted on January 19, 2017 January 3, 2018 Categories CraftsLeave a comment on Connect 4 – on paper!